Anastasia graduated with her Doctorate in Physical Therapy from NYU in 2018. While she is well versed in treating orthopedic conditions at CSC+M, Anastasia’s continuing education has provided a better understanding of pelvic and abdominal health. She offers specialized services at CSC+M to treat conditions including endometriosis, interstitial cystitis, chronic pelvic pain, abdominal cramping associated with menstruation, constipation, and IBD. Anastasia has also worked with clinicians and specialists to develop treatment and exercise programs for pregnancy and pre/post partum care. Anastasia has previously raced internationally as a member of the United Stated National Luge team and competed in Olympic Trials in 2010. She has extensive knowledge in exercise and athletics and attained her CSCS (certified strength and conditioning specialist) in 2016. Anastasia utilizes this knowledge along extensive with life experience to treat all types of athletic based conditions. Dr. Abby Cabalfin Valones graduated from Rutgers University in 2007 with a BS in Exercise Science and Sports Studies. She received her Doctorate of Physical Therapy from New York Medical College in 2011. She is currently a certified Sports Performance coach through USA-W and is certified in RockTape and RockBlades through FMS. She utilizes the knowledge she gained from Neurokinetic Therapy and Postural Restoration to create individualized treatment programs designed to return patients to a healthy, active lifestyle. Abby has a background in volleyball, track, and ballet and currently stays active through weightlifting, yoga, spin, and snowboarding. Dr. Christine Miller graduated Wake Forest University in 2010 with a B.S. in Health and Exercise Science, minor in Entrepreneurship. In 2013 she received her Doctorate of Physical Therapy from SUNY Stony Brook University. 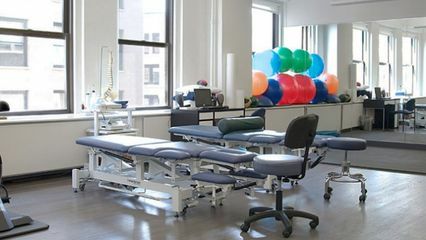 Dr. Miller’s treatment approach combines manual techniques, neuromuscular re-education, and therapeutic exercises tailored to the individual. She is currently certified in the use of the Selective Functional Movement Assessment (SFMA), a comprehensive assessment used to classify movement patterns with manual therapy and therapeutic exercise interventions. She attained her certification in using the Functional Movement Systems (FMS) and is a certified strength and conditioning specialist (CSCS). Dr.Miller stays active as a certified spin instructor teaching classes locally. We kindly ask that you notify us no later than 24 hours in advance for all rescheduling and cancellations to avoid cancellation fee. Thank you.